This ministerial work encourages readers to view life through a faith-driven lens, even when circumstances are tough. 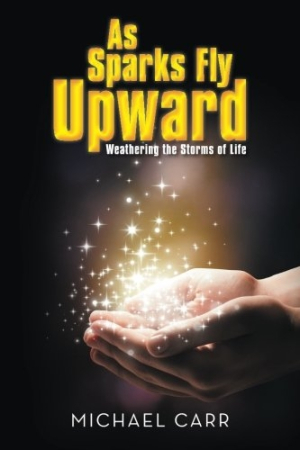 As Sparks Fly Upward: Weathering the Storms of Life by Michael Carr offers encouragement to live in faith, even when life brims with pain and challenges. Carr is a minister, so it’s no surprise that faith is the center of his life. His resolute belief comes not from his vocation, however, but rather from his marriage to Patricia, who faced a decades-long battle with myasthenia gravis, an autoimmune disease. The book is a culmination of Carr’s personal and public spiritual writings. While Patricia’s illness is not a focus of the book, the devotion and difficulty of their life together is the undercurrent of every page. Through it all, Carr grapples with the truth of the Bible and becomes increasingly sure of God’s provision, peace, praiseworthiness, and purity—no matter what life brings. By sharing his journey of faith, he enables others to develop a more genuine faith that moves from head to heart, theory to practice, and brings a life-enriching closeness with God. The book, like many sermons and spiritual reflections, is a balance of incidents from the author’s own life, history, experiences others have shared with him, and anecdotes and comparisons directed at encouraging and exhorting his audience to greater faith. He also delves heavily into biblical stories, particularly of figures like Job, who also suffered and struggled, and Abraham, who faced uncertainty. His knowledge is deep and sound across a range of Christian traditions, and as a clergyperson, he’s able to make complex truth accessible and easy to understand. He also brings a personal warmth and care to the text, even when challenging people to action. Carr’s voice is compassionate and pastoral, and as a former educator and experienced preacher, he conveys ideas in a clear and logical manner, with each idea building firmly on the last, leading step by step to deeper faith. Carr’s voice is relentlessly positive and faith-filled, but it’s not naïve or oblivious in any way. What he shares is rooted in his own pain and learning, and that earnestness comes through on the page, to the benefit of readers. His insights will equip Christians who want to believe in and follow God even in the face of life circumstances that seem too big or difficult. Through his personal experience and scriptural wisdom, he assures them that even such challenging trials are within God’s power and not separated from his presence. For those not even sure their faith is worth clinging to, Carr offers a living example and a firm, hopeful voice, pushing people to truly consider God before walking away. As Sparks Fly Upward prompts Christians to learn to see life beyond the surface, beyond the events that take place, and instead view life through faith in God.